Navelbine® (NVB, vinorelbine tartrate) is a semisyntheticVinca alkaloid in which the catharanthine moiety contains an eight-membered ring in place of the nine-membered ring that is present in all naturally occurring members of the vinblastine group. This modification selectively reduces interaction with anoxalvs mititotic microtubules and may account for the lower neurotoxicity with improved antitumor activity that has been observed in clinical trials with breast, lung and ovarian cancer. We were interested in whether the structural modification in NVB would also alter the drug resistance profile. Specifically, our aim was to determine whether NVB, like vinblastine (VBL), participates in P-glycoprotein (P-gp)-mediated multidrug resistance (MDR). NVB-resistant, murine P388 cells (P388/NVB), were derivedin vivo and used in conjunction with a battery of drug-resistant P388 cell linesin vivo and murine and human tumor cell linesin vitro to develop a resistance profile for NVB. 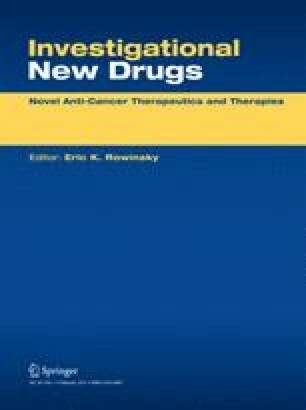 P388/NVB bells were cross-resistant to drugs involved in MDR (doxorubicin, etoposide, amsacrine, vinblastine, vincristine and actinomycin D), but not to the alkylating agents, cyclophosphamide, carmustine, and cisplatin, or to the antimetabolites, 5-fluorouracil and methotrexate. P388/NVB cellular resistance to NVB was stable without drug pressure during continuous passagein vivo for more than ten weeks andin vitro for at least five weeks. These cells exhibited increased expression of P-gp, and a 30-fold level of resistance of NVBin vitro, which was completely reversable with verapamil. The MDR phenotype was confirmed in other tumor models. P388 tumors resistant to vinblastine, vincristine, doxorubicin, and etoposide were cross-resistant to NVBin vivo. Likewise, human KB carcinoma cells resistant to colchicine, MDA-A1R breast carcinoma cells resistant to doxorubicin, and murine B16/F10 melanoma cells transfected with the humanmdr1 gene were cross-resistant to NVBin vitro. Finally, P388 cells resistantin vivo to melphalan, a drug that does not participate in MDR, were cross-resistant to NVB. Therefore, cellular resistance to NVB, like otherVinca alkaloids, may arise by a P-glycoprotein-mediated MDR mechanism, but may also involve non-MDR mechanisms in cells that do not overexpress P-gp.